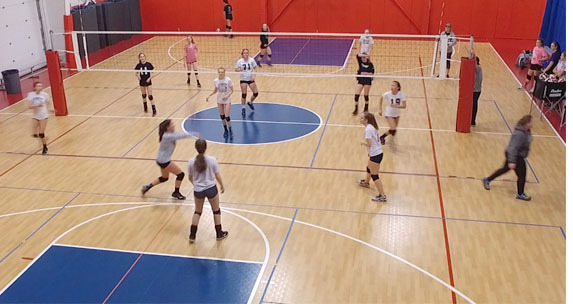 The Danvers Indoor Sports Volleyball Academy is the place where athletes train to learn about the great sport of volleyball, develop strong fundamentals, raise physical skill level, and increase court awareness. The academy is great for beginner and experienced volleyball players looking to refine and advance their skills. DIS Volleyball Academy coaches follow the coaching philosophy that is used by the USA Olympic volleyball program and create an atmosphere that encourages learning while having fun! All camps and classes have a 10:1 coach to player ratio and players will receive at DIS VBA t-shirt. The DIS VBA Skills Class is a weekly skills class that runs every Monday and Wednesday with middle school from 4:00-5:30pm and high school from 5:30-7:00pm. The middle school class is intended for girls ages 9-14, looking to learn the fundamentals and grow in their volleyball knowledge. The high school class is intended for girls who have competed in at least one season of high school volleyball, and will focus on the further development of their individual skills with a focus on game like reps. When registering please choose all 5 Mondays, all 5 Wednesdays, or all 10 days! If you register for all 10 a discount will automatically be applied at checkout! Questions contact Sasha at sasha@danversindoorsports.com. Avidity Volleyball Club was born in Marblehead, Massachusetts in 2013 for one reason, giving girls who are avid about playing volleyball the chance to play more volleyball beyond the high school season. Avidity Volleyball welcomes girls an opportunity to play volleyball in a skill centered atmosphere. Practices are centered around a solid foundation in passing, setting, hitting, serving, and defensive work. Athletes who are a part of Avidity Volleyball Club should expect to push their play to new levels while learning the importance of communication, teamwork, and above all, self-confidence in taking their game to the next level. Avidity Volleyball Club will host teams at the elite, travel, club and futures level this season, welcoming girls from ages 10-18. All Avidity teams practice twice a week. For more information please visit: www.avidityvolleyball.com. Private lessons are available from a certified volleyball coach with experience coaching players 10-18 years old. For more information about pricing and availability please contact: Volleyball Director Sasha Duprey at Sasha@danversindoorsports.com.